Vor ein paar Tagen war ich im Thanksgiving-Wahn (Vorbereitung auf das meiner Meinung nach schönsten Fest im Jahr, nämlich Thanksgiving amerikanischer Art). Ich hatte schon den ganzen Tag verschiedene Sachen gekocht und gebacken, dabei nichts fotografiert, und hatte trotzdem noch Lust etwas hübsches leckeres zu machen. Herausgekommen sind zwei Gänge, die teilweise die gleichen Elemente haben, aber eben etwas anders zusammengesetzt wurden. 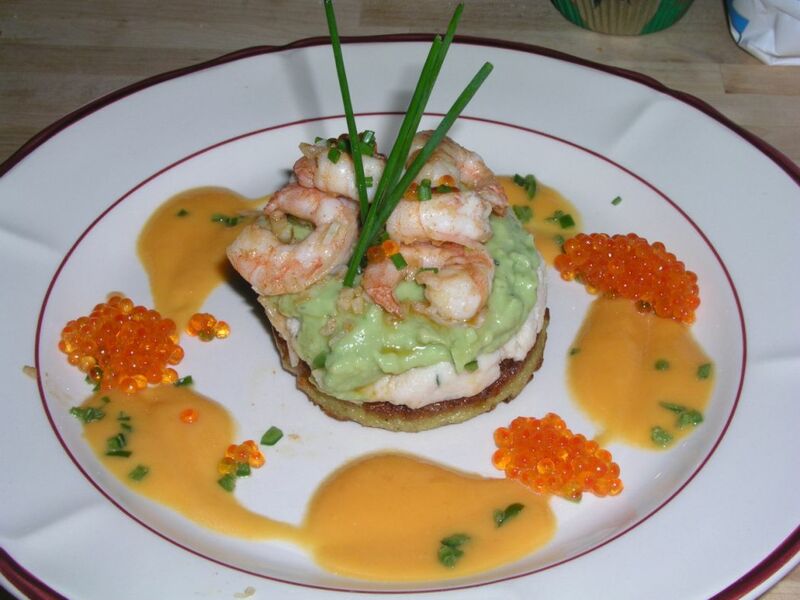 Der erste Gang bestand aus einem Kartoffelpfannenkuchen mit einer Schicht Forellenmousse, Avocadocreme, in Knoblauch gebratene Shrimps mit einer Papayasauce und Lachskaviar. Die grünen Punkte sollten scharfe Peperoni sein, die aber leider keinen Bums hatten. Die Papayasauce bestand aus einer gewürfelten Papaya, 50 ml Sahne, 50 ml Hühnerbrühe, ein Schluck Weißwein und Zitronensaft zum abschmecken. Alles aufmixen, abschmecken. Das Forellenmousse war nur püriert mit Sahne, Salz Pfeffer und gemörserten Senfkörnern. Die Avocadocreme hab ich auch püriert, Limettensaft dazu, gemörserten Koriander und Ingwerpulver. Der 2. Gang hatte Fleisch als Mittelpunkt. 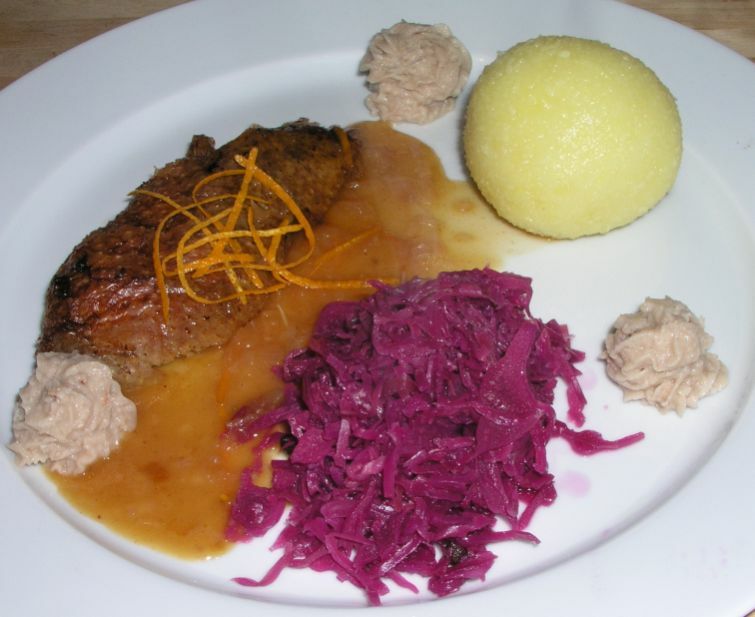 Ein Rinderfilet-Steak von 180 g in der Pfanne auf beiden Seiten scharf anbraten. Daraus 4 flache Scheiben schneiden. 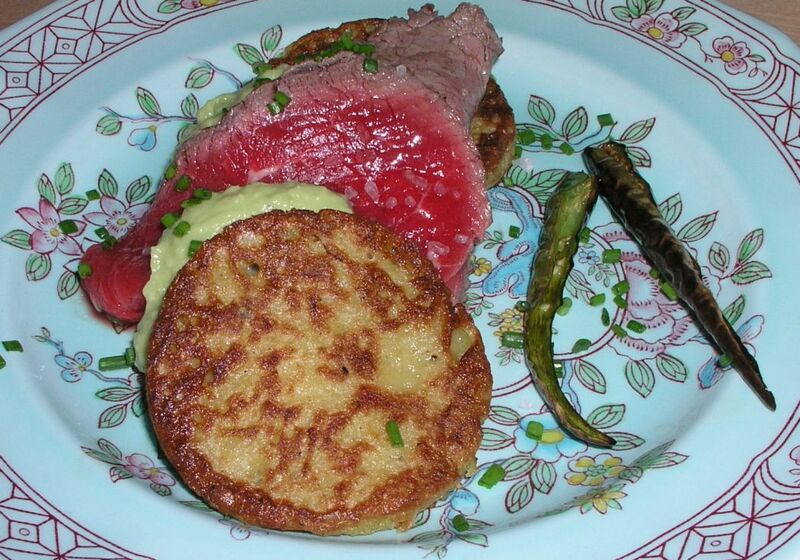 Als Basis wieder einen Kartoffelpfannenkuchen, dann die Avocadocreme, dann eine Fleischscheibe, nochmal Avocadocreme, die 2. Scheibe Filet und dann die scharfen Peperoni. Das Fleisch mag für viele zu roh sein, für uns ist es genau richtig. Die Hauptspeise hat gut geschmeckt, bei der Vorspeise müßte man mit der Dicke der einzelnen Schichten spielen, weil die Forellenmousse ein wenig zu dominant war (durch den Räuchergeschmack). I realize this blog is getting a little duck-heavy. That said, here goes: We usually discuss the food for the weekend on Thursday or Friday. We wanted something we could have both days, in different ways, and goose (the alternative) is a little expensive, so once again, we went for duck. The difference to the other posts is that this duck was a whole duck, not just the breast, and it was roasted until cooked through instead of going for pink meat. When made this way, my better half prefers the german traditional way, i.e. with red cabbage and a potato dumpling and gravy. I decided to add some small things to make it more festive. I admit I bought a grated potato mixture for the dumplings, but everything else was homemade (all the mixture consists of is grated uncooked potato and cornstarch). For the dumplings take a piece of toast, cut into small squares and put 3-4 in the middle of the potato mixture before you shape it into a ball. These balls are placed in simmering water for 25 minutes. The cabbage is finely grated. In a pot, saute a shallot, then add the cabbage. If you just grated the cabbage, you should add a few teaspoons of salt and let it stand for a few hours. This softens the cabbage. Rinse before using. Add some water (doesn’t have to cover the cabbage, because it will be cooking with the lid on.). Then add a laurel leaf, 5 cloves, 5 allspice berries, 5 juniper berries, 1 tablespoon of sugar and a little bit of vinegar. It should taste sweet and sour without masking the cabbage taste. I cooked it for 45 minutes, let it cool off and reheated it before serving. 5 minutes before serving, I added a tablespoon of black currant jelly. The duck was cleaned under water and patted dry. It was placed on a bed of carrots, caleryroot, leeks and parsley. I added some water, and set the oven to 180 C or 356 F and roasted the duck for 40 minutes. Then I turned it over, roasted the other side, flipped it over again and finished roasting it. This took about 90 minutes. For the sauce I sauted a shallot, added some cheap cognac and some red wine, let it reduce a little bit, added a glass of duck stock, let it reduce again, added some of the duck stock from the duck, reduced it again, added the juice of an orange, reduced it, adjusted the seasoning and added some butter-flour pellets to thicken the sauce. Throw some orange zest over the top to finish the sauce. For the chestnut puree I cooked a good handful for about 30 minutes in water, let them cool off a little bit and peeled them. Make sure you peel the inner skin as well. Then I put them through a potato ricer, whipped some cream, added 2 tablespoons of sherry (to play off the natural sweetness of the chestnuts) and combined the whipped cream and the chestnut-sherry mix. This mixture I put into a cookie press, so I could press it into a decorative shape. 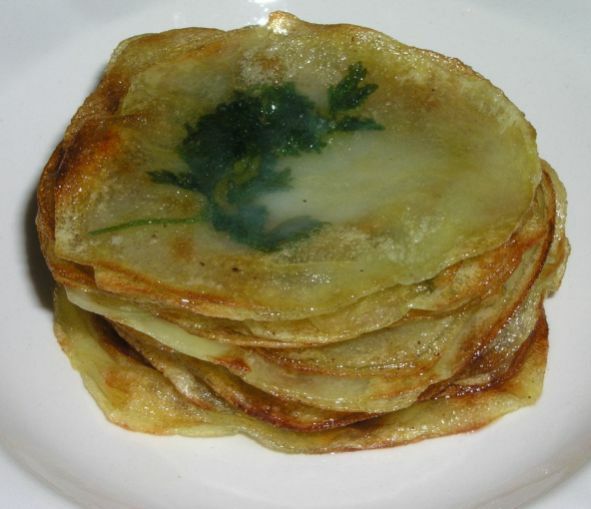 For a variation of this meal, I peeled a potato, sliced it very thinly with a mandolin, placed a chervil leaf between two slices and fried these slices in olive oil. They taste good and look good, too. 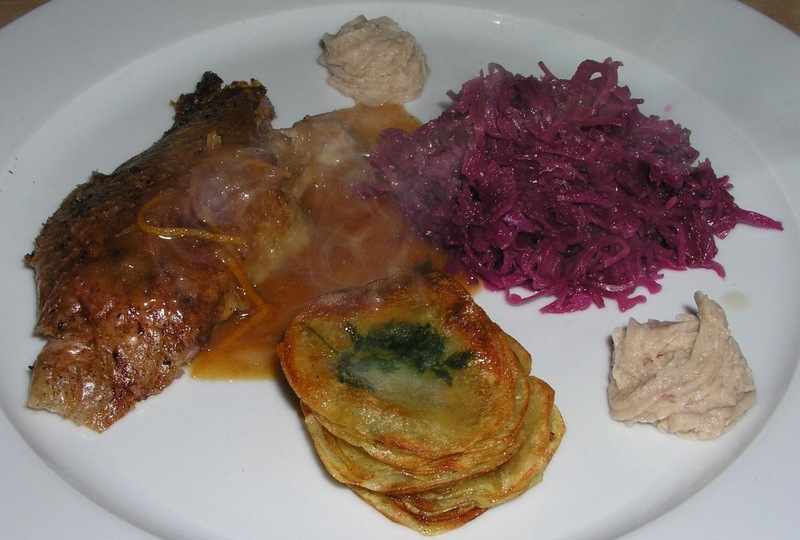 This meal is a standard Sunday meal in fall and winter in Gemany. It was very tasty! The leftover duck will serve as one of the ingredients in this evening’s duck wrap on salad.